Peary caribou are the smallest of all caribou subspecies. 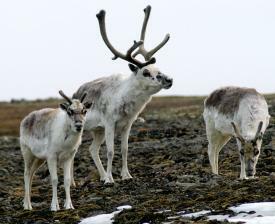 They have shorter faces and legs and are lighter in colour than barren-ground caribou. In winter, Peary caribou have a mostly white coat. Their summer coat is slate-gray with white legs and underparts. Both males and females have antlers. Antlers on adult males are larger than those on females and juvenile males. The velvet covering the antlers is gray, unlike the dark brown velvet of barren-ground caribou. Peary Caribou are found in small groups on the Arctic islands of the NWT and Nunavut. In the NWT, Peary caribou live on Banks Island, northwest Victoria Island and the western Queen Elizabeth Islands. The Arctic Archipelago provides a harsh, treeless environment. Ice fields and bare rock reduce the area where forage is available for caribou. In summer, Peary caribou forage in moist areas such as river valley slopes and upland plains. These areas provide sedges, willows, grasses, and herbs. In winter, the caribou forage in more exposed areas such as hilltops and raised beach ridges where the thinner snow layer makes foraging easier. Historical information on Peary caribou populations is lacking. Population studies have been conducted during the past 30-40 years but they have been limited to certain parts of the range and there have often been long periods of time between surveys. Caribou numbers have increased and decreased on different islands since the first surveys in the early 1960s. Peary caribou numbers in the NWT declined steeply between the 1960s and the 1990s. The overall estimated decline for all three subpopulations in NWT only is from about 36,000 Peary caribou (in 1961, 1972 and 1980) to about 7,250 (in 2010 and 2012, combining totals from different years). This represents an overall decline of approximately 80% for the past 50 years for the NWT population. The declines are likely due to a combination of factors including several years of unusually severe winter and spring weather, hunting, predation, and competition with increased numbers of muskoxen. Over the last 20 years there have been sustained low numbers, however there is recent evidence of an increase in numbers in the Queen Elizabeth Islands and on Banks Island. Females are capable of calving annually, however, this depends upon whether or not they can build up adequate fat reserves over the summer to breed in mid-October. Most calves are born in the last two weeks of June. During summer, willow is an important food for Peary caribou. They also feed on various forbs, herbs, sedges and grasses. During winter, forbs, especially legumes and avens, are important foods. Unlike other caribou, Peary caribou eat very little lichen because very little lichen is available to them. Peary caribou are found in small groups throughout the year and graze while on the move. These are adaptations to the sparse vegetation cover and patchy distribution of high quality food plants that caribou selectively feed on. Peary caribou live in a very harsh environment. In some winters, ice layers prevent caribou from reaching their food. If ice covers a large enough area of the winter range, animals may starve. Harsh winters and/or summers may prevent females from having adequate fat reserves for reproduction. Wolves prey on caribou, but the impact of wolf predation is unknown. There is little information on wolf numbers; however, the number of wolves may be increasing on both Banks and Victoria Islands. Competition between muskoxen and caribou for food may affect population size. In some areas, caribou are harvested for food. Harvesting, in combination with other factors, may have contributed to the decline of caribou population on Banks and Northwest Victoria Islands. Industrial development, especially on calving grounds, could also affect caribou populations. The Inuvialuit have taken a strong leadership role in protecting Peary Caribou. Due to community concerns in Sachs Harbour, a harvest quota for Peary Caribou on Banks Island was implemented in 1990 and is now reviewed annually. The Olokhaktomiut Hunters and Trappers Committee (Ulukhaktok) enabled specific management zones in their by-laws to ensure quotas are followed for Peary Caribou on northwest Victoria Island and harvest remains low. In 2004, COSEWIC designated Peary caribou in Canada as Endangered because their populations continued to decline to critically low levels. Peary caribou were listed as Endangered under the Species at Risk Act in February 2011. In 2015, COSEWIC re-assessed Peary caribou as Threatened. A national multi-jurisdiction recovery strategy is being developed in cooperation with the Government of the Northwest Territories, Government of Nunavut and the relevant co-management boards. In 2012, the NWT Species at Risk Committee designated Peary caribou as Threatened in the Northwest Territories because of low numbers, population decline, and high population variability. In 2014, Peary caribou were listed as Threatened in the NWT under the territorial Species at Risk (NWT) Act. A NWT recovery strategy for Peary caribou is required and is being developed in concert with the national recovery strategy.